Type of mathematical proof: personal preference or adaptive teaching behavior? In our study, 32 German and Swiss 8th/9th-grade classes of lower-secondary school worked with their teacher on the same proving problem. The sample belongs to the Swiss-German study “Quality of Instruction, Learning Behavior and Mathematical Understanding”. Our data analyses relate to the teachers’ approaches to generating a specific form of evidence with their classes when dealing with a particular elementary number-theory problem. We address the question of how the different strategies can be characterized as manifestations of a certain approach to proving and try to clarify in which way the observed approach can be interpreted as adaptive teaching behavior. For this purpose, we searched for possible correlations between three main strategies or types of generating a specific form of evidence (experimental, operative, formal-deductive approach) on the one hand and (a) the teachers’ beliefs and personal characteristics and (b) the students’ prior knowledge of algebra and mathematics in general on the other hand. As our analyses show, three main approaches to proving occurred but not in equal proportions: there is a predominance of the approach that entails the highest extent of formalization and abstraction. Nevertheless, an operative way of proving is widespread too. 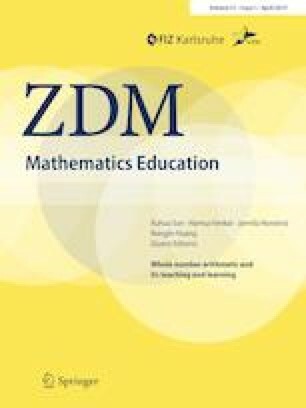 On the whole, the findings indicate that one particular approach to proving can be interpreted as a personal preference of a specific group of teachers and, at the same time, with respect to the students’ mathematical skills as a manifestation of adaptive teaching behavior. We thank the Swiss National Science Foundation (SNSF) for supporting the project. Common Core State Standards Initiative. (2012). Mathematics standards. http://www.corestandards.org/Math. Accessed 10 March 2018.